Welcome to an exciting learning adventure from the latest leg of Expedition 360 - the first human powered around the world expedition! If you are currently navigating the program and wish to return to the Main Map page on the CD ROM, simply close your browser window. On a MAC you can do this by choosing the 'hide' feature in the top right corner of your screen. If on a PC, collapse the browser window by choosing the 'minimize' button in the top right corner of the screen. If you're a first-time visitor to the program, you can sample some of the learning activities and materials available by going to the demo map page. Follow the links from there. 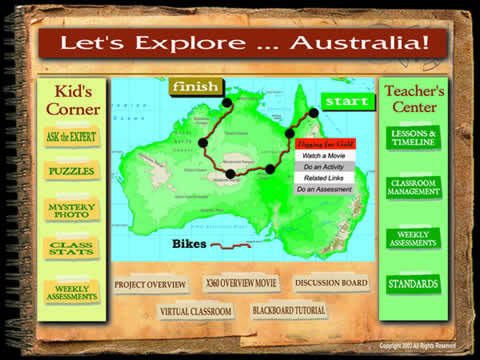 If you're an educator and interesting in having your class join with other classes on a 6-week virtual expedition across the outback via CD ROM and this website, REGISTER NOW for your FREE package. You'll receive a multimedia CD ROM with short movie clips on engaging 'Discovery Zones' from our latest adventure - mountain biking 3,000 miles across central Australia - as well as a Teachers Manual and Technical Support guidelines. A username and password will also be made available to allow access to the interactive sections of the website and additional standard's based lesson plans and activities. 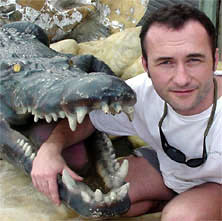 The next virtual expedition starts Monday 21st October 2002. Cut off date for registering is Wednesday 16th October. If you miss this deadline, don't worry! We will be running the series again in the spring of 2003. Register early to ensure your class is secured a place on this next leg. We look forward to seeing you further on down the expedition trail!